Buy now with Amazon Payments! Learn more. Gourmet.Woot purchases now bypass your cart entirely! This means you gotta buy Gourmet.Woot items on their own, using your Amazon Payments account. You can't mix 'em up with stuff from our other sites. This cowboy's ridin' solo. Be aware that anything in your cart from the other Woot sites is still out there and looking forward to your return. We'd hate for anything to sell out while you're reading this. 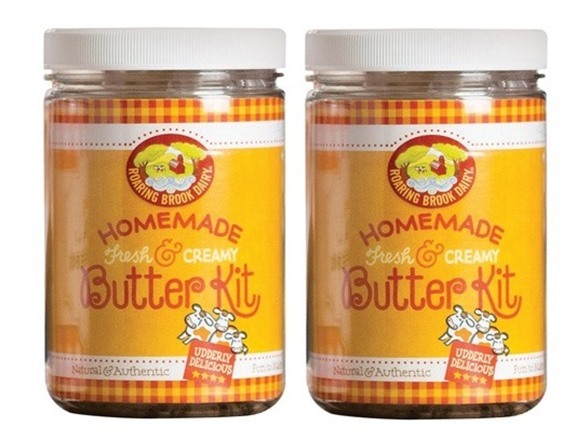 Whether you like it sweet, savory or herbed, with Roaring Brook Dairy's Homemade Butter Kit - you'll never go back to store-bought butter again. All you need is cream! Love the smell of butter melting on a freshly toasted muffin or bagel? 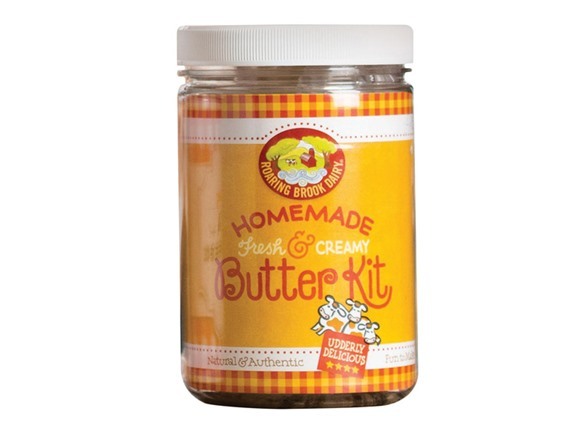 With Roaring Brook Dairy's Homemade Fresh & Creamy Butter Kit, your next morning meal can be topped with sweet, salted, or herbed butter - made in your very own kitchen. Made in the USA. Kit does not require refrigeration. "Do the contents of your kits expire? If so, when?" The contents of our unopened kits are non-perishable, they do not expire and need no refrigeration. However, once opened, the rennet should be kept in the freezer to extend its shelf-life. To make sure your final product is as fresh and delicious as possible, we DO NOT include the dairy ingredient. When you're ready to make the mozzarella, butter, or chèvre, just pick up some fresh milk, cream, or goat milk, and you're all set to go! The DIY era is here! Roaring Brook Dairy is meeting consumer demand with kits and online resources for cooks and non-cooks alike to try their hand at making cheese, butter, and tofu at home. Each kit provides everything you need to create your own farm fresh cheese or creamy butter in your very own kitchen--just add milk! After working in the imported cheese business for close to 30 years, Leslie Kozupsky founded Roaring Brook Dairy in 2010. A self-professed “lousy cook,” when she discovered just how easy it was to make cheese at home she knew she had to share her discovery with fellow cheese lovers. Her mission is to let others know you don’t have to be a cooking connoisseur to master the art of cheesemaking--kids, adults and foodies alike can have fun and gain confidence when given the tools to succeed. She designed the first Mozzarella Cheesemaking Kit with the necessary supplies to make multiple batches of cheese in less than an hour per batch. The Chèvre Cheesemaking Kit , Ricotta & Cottage Cheese Kit , Homemade Fresh & Creamy Butter Kit , and Tofu Making Kit also include all the supplies needed, and each kit features an instruction manual with easy-to-follow illustrated directions, a glossary of terms, troubleshooting tips, and recipe suggestions. Roaring Brook Dairy’s online videos, Frequently Asked Questions, and social media sites round out the assistance available to those making their first attempt or looking for support to perfect their craft.